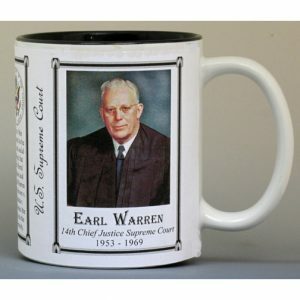 This U.S. Supreme Court Chief Justice Earl Warren History Mug is one of a collection of U.S. Supreme Court biographical mugs. An image of Earl Warren and a short biography are features of this history mug. 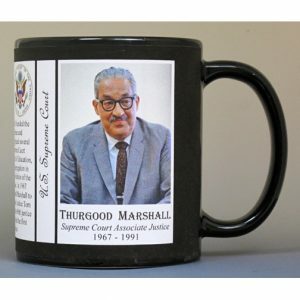 This U.S. Supreme Court Associate Justice Thurgood Marshall History Mug is one of a collection of U.S. Supreme Court biographical mugs. An image of Thurgood Marshall and a short biography are features of this history mug. 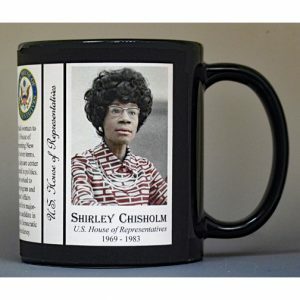 This U.S. House of Representative Shirley Chisholm history mug is one of a collection of U.S. Governance biographical mugs. An image of Shirley Chisholm and a short biography are features of this history mug. This U.S. Supreme Court Associate Justice Sandra Day O’Connor History Mug is one of a collection of U.S. Supreme Court biographical mugs. 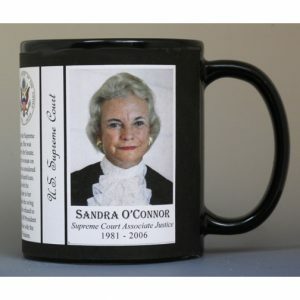 An image of Sandra Day O’Connor and a short biography are features of this history mug. This Lady Bird Johnson mug is part of our First Lady biographical mug collection profiling the women who helped their husband, father, uncle or family friend while he served as president of the United States. 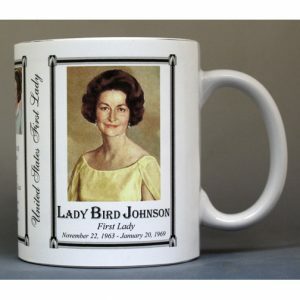 An image of Lady Bird Johnson and a short biography are features of this history mug. 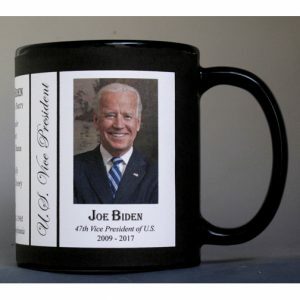 This U.S. President Lyndon B. Johnson History Mug is one of a complete collection of U.S. Presidential biographical mugs. 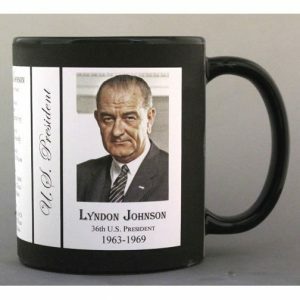 An image of Lyndon B. Johnson and a short biography are features of this history mug. 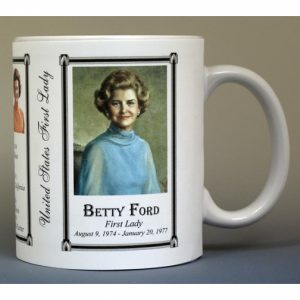 This Betty Ford mug is part of our First Lady biographical mug collection profiling the women who helped their husband, father, uncle or family friend while he served as president of the United States. 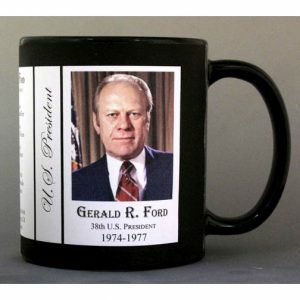 An image of Betty Ford and a short biography are features of this history mug. 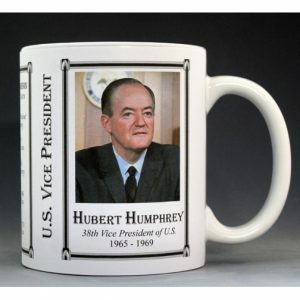 This U.S. Vice President Hubert H. Humphrey History Mug is one of a complete collection of U.S. Presidential biographical mugs. 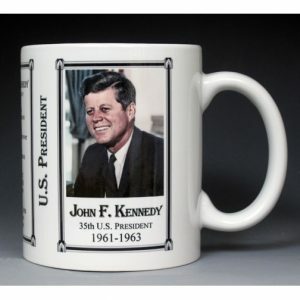 An image of Hubert H. Humphrey and a short biography are features of this history mug. This Rosalynn Carter mug is part of our First Lady biographical mug collection profiling the women who helped their husband, father, uncle or family friend while he served as president of the United States. 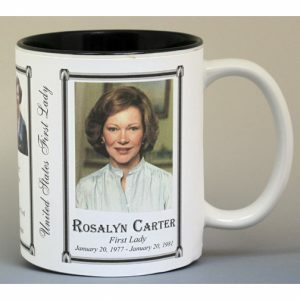 An image of Rosalynn Carter and a short biography are features of this history mug. 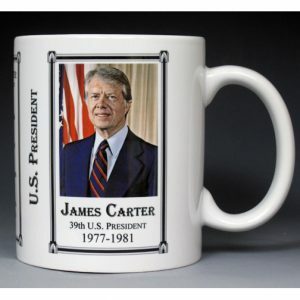 This U.S. President Jimmy Carter History Mug is one of a complete collection of U.S. Presidential biographical mugs. 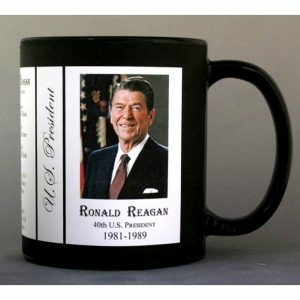 An image of Jimmy Carter and a short biography are features of this history mug. This Nancy Reagan mug is part of our First Lady biographical mug collection profiling the women who helped their husband, father, uncle or family friend while he served as president of the United States. 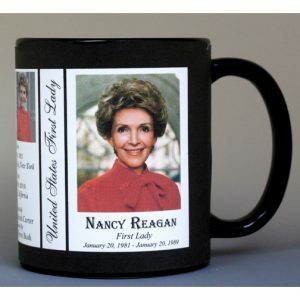 An image of Nancy Reagan and a short biography are features of this history mug. This U.S. Vice President Nelson Rockefeller History Mug is one of a complete collection of U.S. Presidential biographical mugs. 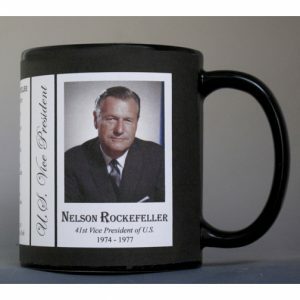 An image of Nelson Rockefeller and a short biography are features of this history mug. 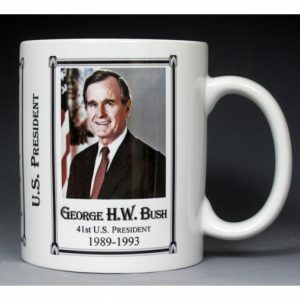 This U.S. President William J. Clinton History Mug is one of a complete collection of U.S. Presidential biographical mugs. 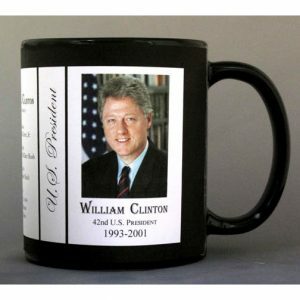 An image of William J. Clinton and a short biography are features of this history mug. The Marian Anderson mug is part of a biographical series profiling unique individuals who shaped the history of the United States. 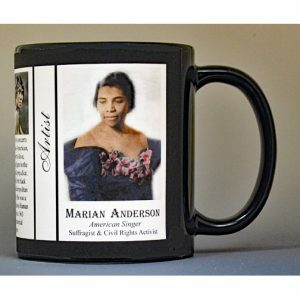 An image of Marian Anderson and a short biography are features of this history mug. The Maya Angelou mug is part of a biographical series profiling unique individuals who shaped the history of the United States. 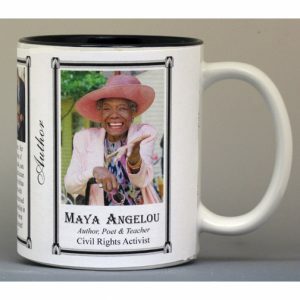 An image of Maya Angelou and a short biography are features of this history mug. The Martin Luther King, Jr. mug is part of a biographical series profiling African Americans who shaped the history of the United States of America. 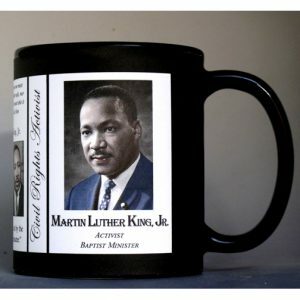 An image of Martin Luther King, Jr. and a short biography are features of this history mug. The Rosa Parks mug is part of a biographical series profiling unique individuals who shaped the history of the United States. 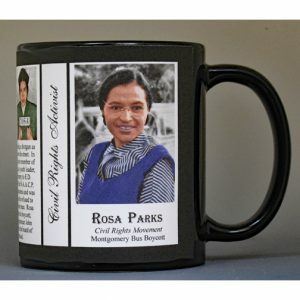 An image of Rosa Parks and a short biography are features of this history mug. The Jackie Robinson mug is part of a biographical series profiling African Americans who shaped the history of the United States of America. 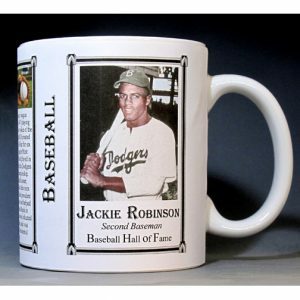 An image of Jackie Robinson and a short biography are features of this history mug. The Babe Ruth mug is part of a biographical series profiling unique athletes in a variety of arenas from baseball to rodeo. 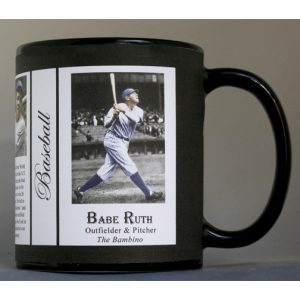 An image of Babe Ruth and a short biography are features of this history mug.